The eighth day of the Druga Navarati in the month of Aswayuja or Ashwin is celebrated as Durga Ashtami. Ashweyuja sukla paksha Ashtami is celebrated as Durga Ashtami. The eighth day of the Sharad Navaratri festival of Goddess Durga is Durga Ashtami. Durga Ashtami of this year will be celebrated on Wednesday ,14th October , 2048. 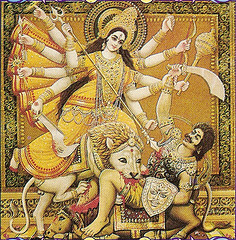 Durga is a Sanskrit word and means undefeatable. Goddess Durga is worshipped by the devotees on Durga Ashtami. It is believed that it was on Durga Ashtami that Goddess Kali along with 64 other Yoginis emerged from the forehead of Goddess Durga. Maa kali killed the demons Chanda,Munda and Raktha Beeja on Durga Ashtami. The other name for Durga Ashtami is Veera Ashtami, weapons of Goddess Durga are worshipped on Durga Ashtami. Durga Ashtami is also known as Maha Ashtami. Followers of Goddess Durga observe a strict fast on Durga Ashtami and eat after sunset. Before eating Goddess Durga is worshipped in the form of Kali.